Yesterday was Jen's birthday. I surprised her by staying home from work and, in the most exciting birthday in recorded history, I did seven loads of laundry. I did not, however, take her out to dinner. We would never disobey her doctor's orders to remain on bed rest. We absolutely did not get into the car, drive to the next town over, and enjoy some fine Italian cuisine. It's such a shame that we are so compliant with her doctor's crazy orders. Tonight I made use of the chard and spinach -- combining them again, like last week -- and starting off by sauteeing the chopped stems and onions before adding the greens. This week's spinach was surprisingly bitter but still enjoyable. I made a batch of creamy polenta with corn meal, chicken stock from the freezer, cream, milk, salt, pepper, butter, and grated Parmigiano-Reggiano. 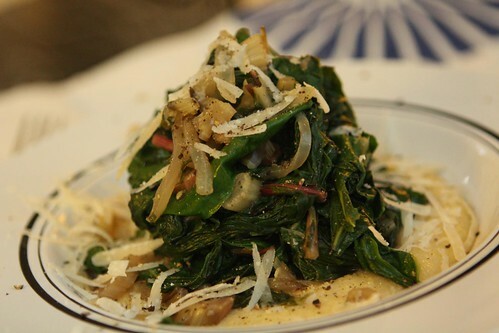 I served the wilted greens on the polenta with a little extra grated cheese and cracked black pepper. For my dish I added a poached egg and stabbed at the yolk, mixing it all together. This was me getting in touch with my Italian roots. 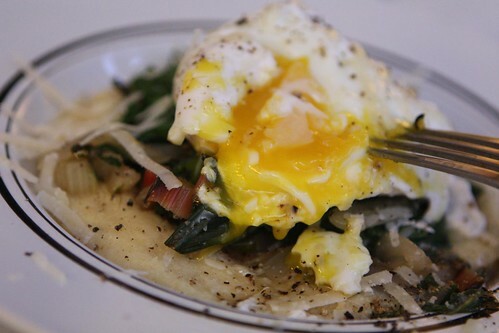 The Italians love to just plop a cooked egg on things right before the serve it. Salads, pastas, sandwiches, cakes, it doesn't matter. If they're Italian they're going to throw a god damned egg on top of it. 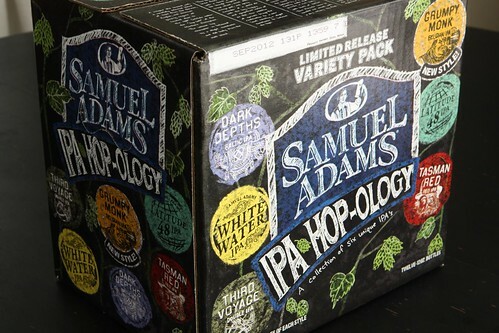 I recently came across this twelve pack called "Hopology" from Samuel Adams. It's a sampling of all their recent IPA offerings all in one box. I've only had one before so I was looking forward to sampling some of the others. For tonight's dinner I paired the Baltic IPA. This was a nice, malty (though not all that hoppy) beer which went down nicely in my super sweet new Sam Adams drinking glass. 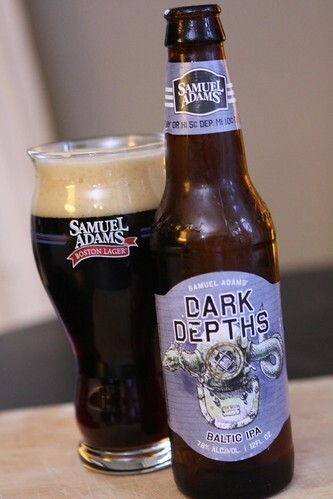 I have long not given Sam Adams enough credit. They've been doing some amazing things, particularly lately, and this beer was quite enjoyable. I'm looking forward to trying the rest, especially the ones with the word "monk" in the name. 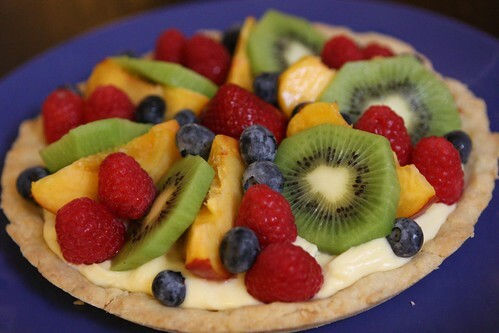 Last night I made Jen her favorite dessert: a fresh fruit tart. Tonight was so much more enjoyable because we just got to eat it. I didn't need to make tart dough, pastry cream, cut fruit, or walk all around town trying to find a store that sells white chocolate. The only thing that could make a fruit tart even sweeter was watching an episode of Eureka featuring the dulcet tones of Sheriff Jack Carter. And wouldn't you know that's just what we did!